Learn about the A' Design Award & Competitions' advisory panel, its' roles and functions. The A' Design Award & Competitions' Advisory Panel is composed of academics, design professionals and industry veterans who contribute ideas and oversee the incremental improvement of the overall experience of the A' Design Award and Competition. The Advisory Panel provides scientific input and guidance based on research and past experience to the awards program to ensure that the award is organized in a fair and professionally correct manner. Advisory Panel members are hand selected group of design, architecture, computer science, media, public relations and marketing leaders invited based on their vast industry expertise and experience as well as their academic backgrounds, past achievements and prior participation or involvement with other accolades, design awards and competitions. Prior to the A' Design Awards' call for entries, the Advisory Panel (also called the Advisory Board) work together to help determine key factors relating to the awards program such as different judging criteria, evaluation methodology or new competition categories. 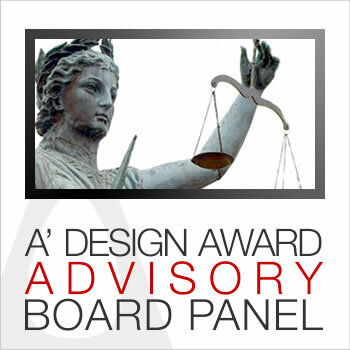 The A' Design Awards' Advisory Board is distinct from the actual governing board of directors, and has no authority other than what is granted to it by the governing board; the role of providing a neutral viewpoint to the competition, to identify issues, opportunities and potentials, to suggest new ideas to improve the competition to make it more prestigious, sustainable and credible. The A' Design Award Advisory boards is especially important as an idea-engine that generates valuable ideas, regardless of their financial viability to bring more value to the organization. Implementation of an advisory board who does not consider any economic aspects when suggesting new ideas ensures A' Design Award and Competition to run a professional prestigious accolades renowned worldwide with unique solutions implemented to create more value for award participants. The A' Advisory Panel bring helpful resources of time, talent, brainpower and treasure to the organization through constructive feedbacks, commitment to ethics, appropriate suggestions and transfer of experience. The A' Design Award Advisory Panel does not participate as a part of the jury; the role of the jury is to judge the entries; and the role of the advisory board is to judge the competition itself. Each Advisory Board member is selected for their knowledge and experience in design and design research. The A' Design Award & Competitions' Advisory Panel could be compared to "Scientific Advisory Boards" as seen in academic conferences and events. The Advisory Board includes key design leadership, public and private community leaders, and/or active members in the design industry. It is essential for A' Design Award and Competition that the Advisory Board maintains a healthy balance of designers, architects, media members, marketing professionals, artists, developers, financial professionals, design professionals, consultants, educators, government officials and not-for-profit community leaders. A' Design Award advisory board provides advice regarding the implementation and operation of the accolades , and to ensure that A' Design Laureates get fame, prestige, recognition, international awareness, credibility and publicity they deserve. Please kindly note that the Advisory panel is different from the "Jury Panel", for more information about the A' Design Award and Competitions' jury panel, click here.